The party manifestos are coming thick and fast, and now the incumbent Conservatives have detailed their vision for the next five years. From an energy and climate change perspective, here’s all you need to know. In their backing of low-to-no carbon energies like renewables, David Cameron and co repeated the ‘must be cost effective’ caveat again and again. The manifesto says the Tories “continue to support the UK Climate Change Act” but also stresses that cutting emissions should be done “as cheaply as possible” — and without a “distorting and expensive” power sector target. In saying that they are explicitly rejecting the advice of the Committee on Climate Change (CCC). The latest government auctions for clean energy suggest onshore wind is the cheapest form of low-carbon power (compared to, say, offshore wind) — but it’s not one the Tories favour. 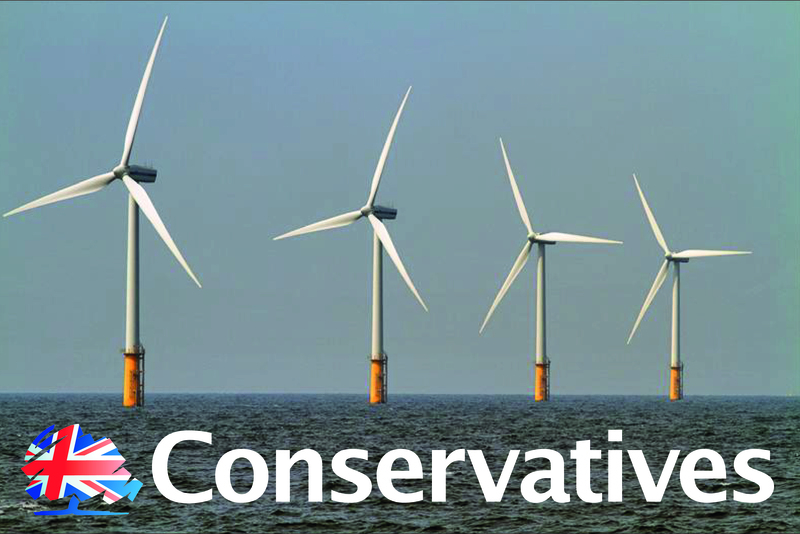 One of the clearest energy aims of the Conservatives is their pledge to “halt the spread of onshore wind farms”. Cameron intends to stop new subsidies for onshore wind and change the law “so that local people have the final say on wind farm applications,” not the planning inspectorate which may take into account national priorities. Though they acknowledge its “meaningful contribution to our energy mix”, the Tories have a problem with onshore wind’s inability to provide consistent capacity — and it doesn’t help that countryside constituents aren’t often fans. Because the Tories remain committed to meeting the UK’s legally-binding 2020 renewable targets the cap on onshore wind may mean they do so more expensively than they otherwise would have done. In keeping with their cost-consciousness, the Conservatives have embraced energy efficiency, announcing their intention to insulate more than a million homes in the next parliament. That number sounds impressive, but it actually represents an 80% cut in the number of home treated compared to the last parliament, according to statistics from the Association for the Conservation of Energy. Ed Matthew, Director of Energy Bills Revolution, told Unearthed: “This is such a small number it is incredible they included in the manifesto at all. “It works out as 200,000 ‘low cost’ measures per year. That’s less than half of the number of measures installed last year under the badly failing Green Deal and ECO. They’re particularly keen on smart meters, and claim every home and business in the country will have one by 2020 — “delivered as cost-effectively as possible,” of course. Shale is a friendlier word than frack, so that’s what the Tories have opted for in their manifesto. They’re proud to have birthed the new industry – which hasn’t actually been delivered – and “will continue to support the safe development of shale gas”. Since Lancashire – and other parts of the North – looks the most likely to be fracked, Cameron has pledged to create a Sovereign Wealth Fund for the region “so that the shale gas resources of the North are used to invest in the future of the North”. For everywhere else, there’s still “community benefit packages”. As they point out in their manifesto, the tax cuts introduced last month for North Sea oil and gas operations represents a show of support for the struggling sector. It was this government that green-lit the subsidised nuclear station at Hinkley Point, so it’s little surprise that they’re calling for a “significant expansion in new nuclear”. Beyond 2020 – when they are bound by EU renewable targets – this also gives them a way to cut emissions without any of those pesky onshore windfarms. An awful lot in the Tory manifesto is self-congratulation, and the section on energy market reform is no different. They’re are pleased to point out how much small energy suppliers have grown, and say “political intervention” is the best way to keep the market fair. That intervention, it appears, consists of implementing recommendations from the recent Competition and Markets Authority investigation (see point 3). As part of his promise to create a Northern powerhouse, Cameron has pledged to electrify all the main rail routes. He’ll also back the Energy Research Accelerator in the Midlands, supporting innovation in the carbon-intensive motor industry. Also in this part of the document is a promise to invest in energy research in Blackpool, Cumbria and Thornton (this may be for fracking). Besides saying they’ll pay more attention to climate change impacts on wildlife and habitats, there’s not really anything substantive on climate change. They do say, however, that they’ll “work to prevent climate change and assist the poorest in adapting to it”. Following last year’s pretty bad flooding, the Tory party have pledged to build 1,400 new defence schemes that should protect around 300,000 homes. They’ll also do “even more to tackle air pollution” — but I don’t know what that means. True to the (old) logo.